The Paul's Fishing Kites Bottom Longline Rig is by far the simplest and easiest of the kitefishing rigs to use. 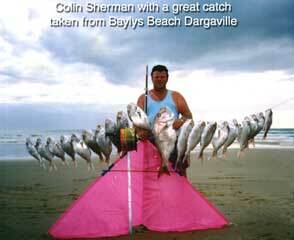 It is also the most popular method of kite fishing in New Zealand. Kite fishing longline rigs will set up to 25 hooks, which is the maximum permissible in New Zealand under the current (2001) amateur fishing regulations. The popular and powerful Bottom Longline Rig is ideal for fishing over clear snag-free areas and while many experienced fishers use this rig single handed it is easier if a helper is available. Most Bottom Longline Rigs have a 1000 metres of mainline although many kitefishers have increased the length of their mainlines to up to 2000 metres. This gives them a better chance of setting their hooks where the fish are in shallower areas like Orewa Beach. Bottom Longline Rigs are very similar to the older style of kontiki type fishing but give the fisher many more productive and fishable days. Unlike kontikis, the fishing kite is using the much stronger and steadier wind available 100 metres above the surface of the water. This ensures maximum pull to tow the gear out from the start of the set. By using a large delta fishing kite which can be tacked up to 60 degrees (such as the Super Kite, Nighthawk Kite or Delta Force), this rig can be fished with the winds going straight up the beach, down the beach or any offshore angle. Adding a Large Skyhook from Paul's Fishing Kites to this rig will further increase your fishing days by providing more pull in lighter winds and greater power for tacking. The Bottom Longline is the perfect choice for any of the clear sandy east coast beaches of the North Island of New Zealand. From North Cape to the Bay of Plenty, there are few shark problems, low rips and massive areas of productive clear sandy beaches. The west coast on the other hand is a high energy coast which often has strong rips and is frequented by sharks at different times of the year. Newcomers to kitefishing are advised by Paul's Fishing Kites to begin with one of the Dropper Rig systems if most of their fishing will be from west coast beaches. This is because with the longline system, if the mainline snags or is bitten by a shark, it could break and the kite would be lost. Many experienced west coast kitefishers enjoy the simplicity and productivity of kite longline fishing rig. 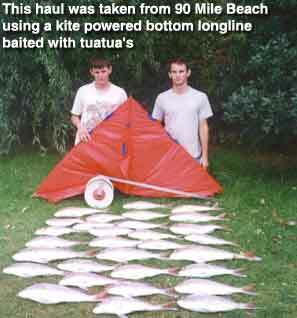 The occasional kite loss is considered a risk worth taking due to the phenomenal catches taken on the west coast.